The head gasket is a vital engine component that acts as a barrier between the engine block and the cylinder head. It is placed in such a way that it separates the combustion chamber from the coolant passage. Which means the head gasket comes in contact with both extremely high temperatures and cool to warm temperatures. It is natural that the head gasket fails while fighting varying temperatures from both sides and generates a leak. The issue now is that you cannot easily identify a blown head gasket. It is not easily visible, because it hides inside the engine, which means in order to check a head gasket failure you would have to open up your car’s engine. Fortunately, there are other ways of determining a blown head gasket and they are easily visible. Given the nature of a head gasket problem, symptoms have to be clearly examined in order to determine a bad head gasket. When the head gasket is functioning properly, you will hardly experience an overheating engine. That is if you are regularly checking the radiator for water and coolant levels. However, if your head gasket fails, you will see the temperature gauge rise. This is something you don’t want, as a hot engine is a dangerous engine and if you don’t solve this issue quickly you are looking at a possible engine replacement. There are generally two ways to look at head gasket failure. Check for smoke from the radiator: For this method to work you need patience. First off you start your car and let the engine run. Pop up the hood, open the radiator’s cap and wait for the engine to heat up. Keep your eyes fixated on the radiator’s opening. Once the engine heats up you will see white smoke rising from the radiator opening. If that happens you might have head gasket failure and you need to schedule a visit to the mechanic. Check for smoke from the exhaust pipe: This method works the same as the one above. Start your car and wait for it to heat up. If you see white smoke emitting from the exhaust pipe you are in for a trip to the workshop. This can also happen if there is a leak in your radiator piping or in your radiator itself, but a sudden loss in fluids can mean a failure of the head gasket. The first thing you should do to learn more about this situation is to check your radiator fluids every day. Fill the radiator with coolant and look for any visible signs of leakage and if you are experiencing loss in liquid every day your head gasket has blown for sure. We all know the color of the oil. If one day you are checking your car’s oil levels and you suddenly see the oil does not look like it is supposed to, you are probably looking at head gasket failure. When the seal breaks, both the engine coolant and the oil from the combustion chamber mix together. This mixture of water and oil inside the engine can give the oil its unique color. If things have gone this far, it means your problem has extended to dangerous proportions and you are reducing the life of your car’s engine. When the relatively cool water comes in contact with the extremely hot oil from the engine, the water starts to boil up and finds a way to escape. The weakest link is the radiator overflow tank on the side. If the head gasket fails, you will see bubbles appear in the coolant and the overflow tank will probably blurt out its contents due to pressure. Why waste time visiting the mechanic to solve your head gasket problems when you can take care of it yourself? Fortunately, products like head gasket sealers are now available in the market for a reasonable price. These instant sealers provide you a quick but temporary fix for your head gasket problems. They are safe for engines and a good option for you because by investing in one you can save some valuable dollars by stalling a visit to the mechanic. However, it is advisable not to depend on a head gasket sealer for long. They are not a permanent solution, which means at the end of the day you would have to spend some bucks at your local mechanic’s workshop. In the most cases, you have to replace the head gasket if it’s bad and you want a permanent solution. Remember that you do often have to make sure the head is flat within the replacement, you have to let a workshop take a look at the head before fitting the new gasket. 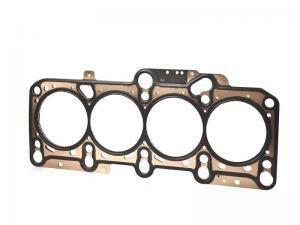 The head gasket is a very small but important component of an engine. The head gasket itself is pretty csheep.. You could expect to spend $30 to $120 on a gasket but that is the good news. The bad news is that the head gasket is situated inside the engine. So, in order to get it replaced, your mechanic needs to disassemble the engine’s head and replace the old head gasket with the new one. Just by reading this you can imagine the hard work that would go into replacing your car’s head gasket. Therefore, expect a hefty bill, probably between $1,000 to $2,500. Keep in mind, the make and model of your car, as well as the type of engine, is a big factor in determining the price of replacement.